Sergio El Darwich brings the ball up the court for the University of Maine during a recent game at the Cross Insurance Center in Bangor. 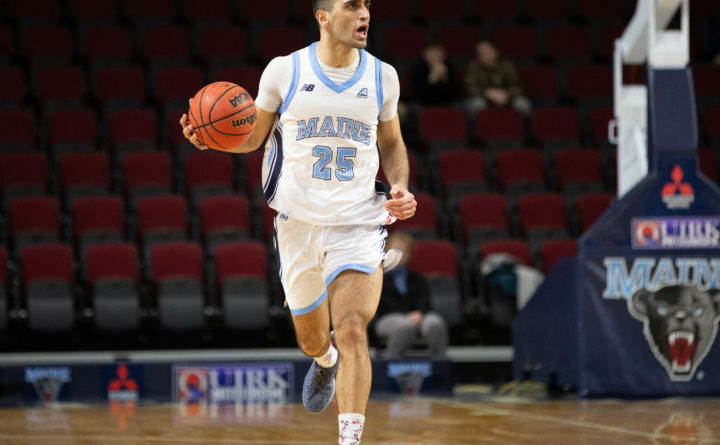 El Darwich scored 11 points and recorded 10 assists in Maine's 67-66 loss to the University of Maryland Baltimore County on Sunday in Bangor. Struggling all afternoon from beyond the 3-point arc, the University of Maryland Baltimore County men’s basketball team made its final four shots from long distance Sunday to outlast the University of Maine 67-66 at the Cross Insurance Center. Defending America East champion UMBC improved to 15-10 overall, 7-3 in AE play. UMaine fell to 5-20, 3-7 in AE despite leading for 27 minutes and 28 seconds of the 40-minute contest. “It was frustrating,” said UMaine junior forward Andrew Fleming, who contributed 15 points and eight rebounds to the Black Bears’ effort. “I felt like at times we were giving ourselves a good chance to pull away and then one possession would happen and they’d be right in it still. “We just need to focus more. We lost focus and that’s how they got those open shots at the end. Junior guard K.J. Jackson scored a game-high 22 points for UMBC while graduate forward Joe Sherburne, who hit two of the late 3-pointers — including the shot that gave UMBC the lead for good with 2:38 left — had 21 points and nine rebounds. Redshirt junior guard Isaiah White joined Fleming among four UMaine scorers in double figures with 17 points. Junior guard Sergio El Darwich, pressed into point-guard duties with freshman Terion Moss of Portland sidelined by a concussion suffered during Wednesday’s loss at Vermont, had 11 points and 10 assists and redshirt junior center Vincent Eze scored 10 points. A reverse layup by sophomore forward Vilgot Larsson gave UMaine a 55-53 lead with 3:36 left before UMBC went on its late 3-point barrage after making just 5 of its first 28 tries from long range. First Jackson struck from beyond the top of the key with the shot clock winding down to give the Retrievers a one-point lead. After Larson made 1 of 2 from the line Sherburne gave UMBC a 59-56 edge with a straightaway 3-pointer over the top of the UMaine zone from 6 feet beyond the arc. Sherburne struck again from deep on the left wing and then fed Ricky Council II for another 3-pointer to give UMBC a 65-59 advantage with 1:27 left. The Retrievers’ lead was still 67-61 after Jackson made two free throws with 13.7 seconds left, but UMaine reserve guard Dennis Ashley kept hope alive with a 3-pointer from the left corner after faking a defender into the air to make it a one-possession game with 5.3 seconds left. UMaine then tipped the inbounding pass and Eze gained possession and scored to pull UMaine within 67-66 with two seconds left. UMBC inbounded the ball again, and while UMaine attempted to foul none was called and time expired. El Darwich, who became the first Black Bear with a double-double in points and assists since Xavier Pollard had 15 points and 12 rebounds against Siena on Nov. 25, 2012, dished out six assists in the game’s first nine minutes as UMaine built a 19-11 lead, but UMBC rallied to tie the game at 32-32 entering intermission.